Flanked by rugged mountains, vast deserts, and an endless expanse of outdoors, Apache Junction is one of the best places in Arizona to explore. If you’re there in the spring be sure to enjoy the lush desert vegetations, cacti, and wildflowers that are in bloom throughout the area. 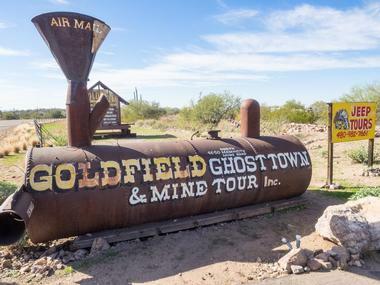 Visitors of all ages love taking a mine tour and panning for gold or going on an exhilarating zipline ride at Goldfield Ghost Town. 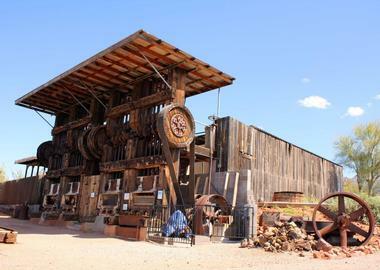 Other fun places to visit that are unique to the area include Superstition Mountain Museum and Mammoth Mine Rock Shop. Whether you’re hiking, off-roading, or horseback riding, there are several places in Apache Junction that will take your breath away. 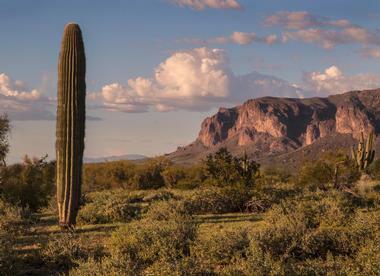 Spanning over 320 acres, the Lost Dutchman State Park was founded in 1977 and has been a popular choice with Apache Junctions visitors and residents who enjoy hiking, camping, mountain biking, and other outdoor activities. The hiking trails are suitable for all levels of hikers, beginners or advanced, and can take you through the native plant garden or to the Flatiron. There are several events and programs held at the park throughout the year such as the early morning ‘Salute to the Sun Hike’ and going ‘Desert Scorpion Hunting’ in the dark of the night. Wildlife that you may come across while you’re there include javelina, jackrabbits, coyotes, and mule deer. There’s no larger collection of Wild West movie memorabilia than at the Superstition Mountain Museum. 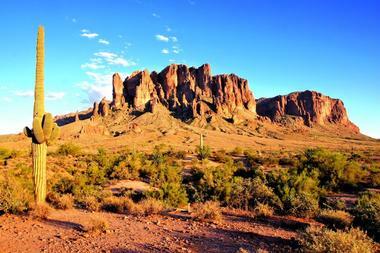 You’ll find the museum at the foot of the Superstition Mountain range right in the middle of the Arizona desert. In the museum, you’ll see several old movie sets, horse-drawn buggies, mannequins, and even a couple of full-sized dioramas. 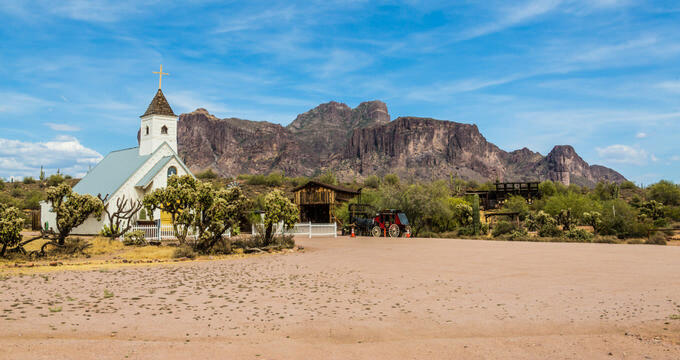 Other aspects include a taxidermy display of native wildlife, several artifacts from the Lost Dutchman’s Mine, and the nearby Elvis Chapel, which is on the site of where Elvis Presley’s movie “Charro!” was filmed. Their gift shop is filled with tons of little souvenirs you can buy for yourself or friends back home. Based in Goldfield Ghost Town, the historic Apache Trail Tours will take you on a guided journey through Arizona’s deserts and canyons. Be sure to take your camera as you will see some stunning views of your surroundings and learn a lot about the land from your expert tour guide. Tours end with a trip to the Old West; in Goldfield Ghost Town you’ll be able to take part in several unique activities, buy souvenirs from the western shops, and enjoy the delicious cuisine in their many eateries. Take your best shot at the shooting gallery, take an old-time photo with costume and all, or strut your stuff with an authentic cowboy hat. Though it’s easy to pass Silly Mountain Park and miss it, do not overlook this amazing opportunity to explore Apache Junction’s flora and fauna in all its magnificence. The trail is single track and is wonderful for hiking as well as mountain biking - some of the sections are smooth and flowy while others are tight and twisty, giving you the perfect combination for an outdoor adventure. There are several trails to choose from such as the Palo Verde, the Brittle Brush, Superstition View, Jackrabbit, Coyote Loop, Old Baldy, and Old Mine, which is better for more experienced hikers and bikers as it has a few steep drops. 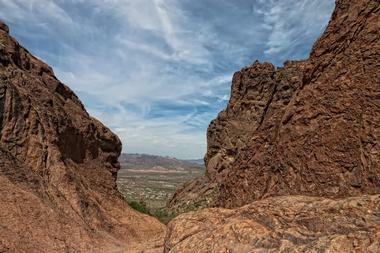 The Siphon Draw Trail is named after its ability to ‘siphon’ water off of a large area on Superstition Mountain. A walk on the trail will take your through the discovery trail and to a polished slick-rock waterfall, which marks the end of the trail and lets your return the same way you went. The hike is less than two miles and goes through the Lost Dutchman State Park, Tonto National Forest, and the Superstition Wilderness Area. There’s a lot of history surrounding Siphon Draw Trail, much of which you can learn about at the Visitor Center. There are a lot of picnic tables surrounding the area, so you can bring a basket with you to enjoy lunch. Several of the strategically placed bird feeders and water ponds will attract flora and fauna for you to see while you’re there. Sitting on an old mining site in Superstition Mountains, the Mammoth Mine Rock Shop has been around for over fifteen years and has one of the largest collections of worldwide minerals and rocks. It is owned and operated by Ron Feldman, who came to Arizona in 1968 because of his interest in western mythology and lost gold mines and has become an authority on the subject over the years. There are hundreds of handpicked minerals, crystals, rocks, and fossil specimens for you to browse and purchase at the shop - you’ll be able to see some unique fossils such as dinosaur bones while you’re there. Amateur photographers and mid-level professionals flock to Journey in Common Photography Workshops so that they can learn and better themselves with tips, tricks, and a tour with a local artist, David Westfall. The four-hour workshop will enable you to take some breathtaking photographs of iconic desert sunsets and rustic western frontier life. You’ll learn some great techniques and come across exquisite photo opportunities with this experience. Classes have no more than six participants, ensuring that the entire experience is intimate and allows for one-on-one discussions. 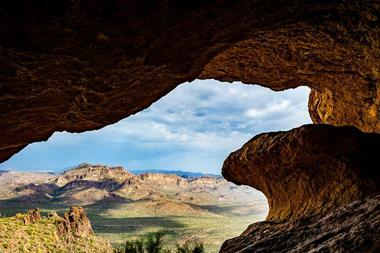 You’re sure to have an amazing time and will have excellent photographs to commemorate your trip to Apache Junction. 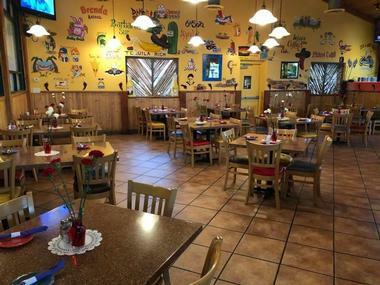 Los Gringos Locos is a Mexican grill and cantina that is a fresh, friendly, and festive place to dine. The servers are friendly and professional and will be able to suggest a delicious dish for you to enjoy based on your likes and tastes. The restaurant has been around for over fifteen years, feeding its patrons with delicious, healthy cuisine; popular items from their menu include their taquito or nacho special appetizers. You can build your own quesadilla with a combination of meats, veggies, and cheese, have a chimichanga topped with sour cream or guacamole, or enjoy a refreshing fajita salad. Filly’s Roadhouse Restaurant & Lounge is an Arizona favorite that combines good food, a patio with gorgeous views, live music, and dancing. You’re in for such an exhilarating experience that truly encompasses everything that is great about an authentic Arizona-style restaurant. Their fried chicken is famed with locals and visitors and is a must-try when you’re out there, as is Filly’s Famous Wings which comes with a choice of sauces such as mild, medium, hot, sweet BBQ, spice BBQ, teriyaki, and garlic parmesan. Other items on the menu include their chili cheese burger, baby back pork ribs, the salmon dinner seasoned with lemon pepper, and the broasted chicken dinner with comes with fries, corn bread, butter, honey, and a choice of applesauce, coleslaw, or potato salad. Focusing on good food, good friends, and good times, Dirtwater Springs is a beautifully rustic restaurant that locals and visitors head to enjoy delicious food. It’s extremely nostalgic with its brass bar fixtures, plank floors, and hundreds of antiquities and decor scattered throughout the place - you’ll really see a piece of South West history if you take the time to explore. Their menu includes appetizers, sandwiches, steak, and Chuck Wagon favorites such as fried chicken, grilled pork chops, barbecued ribs, and jumbo fried shrimp. They have a South of the Border menu which gives patrons additional dining options like burritos, chimichangas, tacos, enchiladas, and homemade chili. Home to the best entertainment in Apache Junctions, Barleens Dinner Show has a variety of acts. 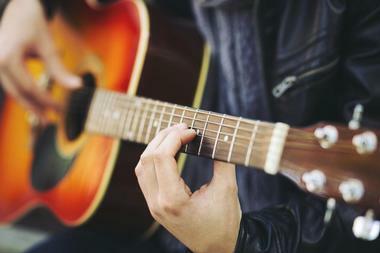 You’ll be able to enjoy musical performances from classical to country and big band to rock ‘n roll, as well as comedy acts that will leave you splitting your sides with laughter. During the show, you’ll be able to feast on meals “just like grandma used to make” - their Traditional Plate comprises slow-roasted beef, classic pan gravy, creamy Yukon Gold mashed potatoes, and steamed Parisian carrots served with a crisp salad and whole wheat roll. Their vegetarian Healthy Plate option features a refreshing salad and a portion of Cowboy Caviar, which combines white corn, beans, onions, and red and green peppers. 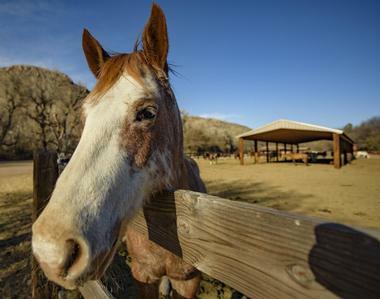 The OK Corral stables are open all year long and offer an opportunity for you to go horseback riding through the historic and beautiful East Valley. The stable was established in 1968 and is a family owned operation which will provide you a beautiful horse and a knowledgeable and experienced guide to take you through the trail. You’ll be able to learn all about the history of the area, Goldfield Mountains, the Superstition Mountain Range, and the Lost Dutchman Mine. It’s not uncommon to come across a number of local flora and fauna during your ride as well. Located within Goldfield Ghost Town, Superstition Zipline is a daring and dynamic experience that will give you stunning above-ground views of the surroundings. 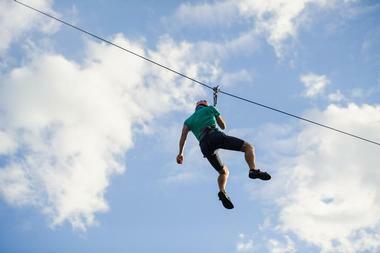 The one-of-a-kind zipline has both day and night rides through the once bustling mining town. The ride takes you high in the air through Goldfield Ghost Town and shows you gorgeous views of the town, the surrounding lake, the mountain views, and the beauty of Lost Dutchman State Park. You may even be able to see some sights of the wildlife and birds that call the area home. The breathtaking journey is safe for visitors of all ages, young and old.